In 1983, President Ronald Reagan declared November as National Alzheimer’s Awareness Month. Little did we know that, just ten years later, he would share his own Alzheimer’s diagnosis with the country, shining a light on a disease that continues to outsmart researchers. 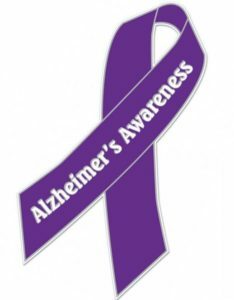 Though strides in research are making headlines – doctors are investigating predisposition, early diagnosis, symptom abatement and a possible cure – the effects of Alzheimer’s disease continue to ravage families at an alarming rate. This month, join the Alzheimer’s Association and thousands of organizations and Alzheimer’s patients by going purple and raising awareness. Seniors First offers several resources for individuals and families struggling with an Alzheimer’s diagnosis including housing placement and adult social daycare. Please contact us if we can be of service.